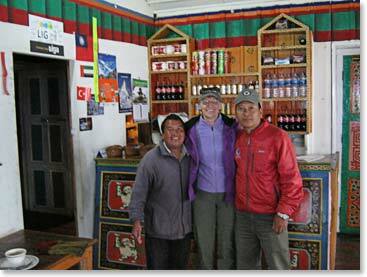 Today at 3:00pm, Dave and Joanne arrived at Phakding where they spent their first night in the Khumbu. 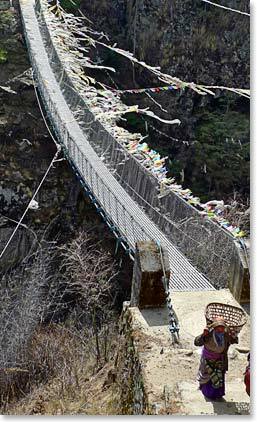 They began their day in Namche and traveled back down the Namche Hill and across the big suspension bridge at the bottom. Tonight they will surely sleep soundly in their cozy lodge along the banks of the Dudh Kosi River at a much lower elevation of 8,560ft/2,601m. Dave and Joanne crossed the famous suspension bridge across the Imja Khola River at the bottom of the Namche Hill this morning. Back to where it all began with Rom, the manager at our lodge, along the banks of the Dudh Kosi River.